This is our first official week back to school. I've spent the week leading professional development and helping teachers prepare their classrooms. Each classroom has to have a beautiful library! And each classroom has to have a great read aloud for the first day of school! And baskets of sure-to-grab-even-the-most-reluctant-reader's-attention on every table! And poetry, of course there must be poetry that first day! Kalli Dakos is a teacher/poet I have loved for many, many years. I stumbled across her first book, IF YOU'RE NOT HERE PLEASE RAISE YOUR HAND, shortly after it came out. The poem I'm sharing today comes from PUT YOUR EYES UP HERE! 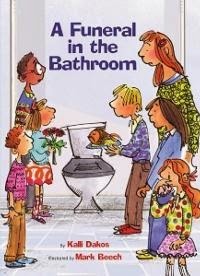 I think my favorite Kalli Dakos' book, just because it's a guaranteed kid pleaser is THERE'S A FUNERAL IN THE BATHROOM. I love to cruise by one of those "pretend readers" desks on the first day of school and just slyly slide it onto the corner, then wait to see what happens. Here's a poem I might use the first day of school. 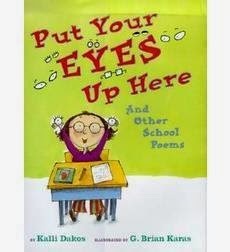 Kalli has a PDF of ten back-to-school poems on her website! Another poem I will probably use that first week is "Now" by Prince Redcloud. I might also use Judith Viorst's poem, "The First Day of School." Irene Latham has a whole bunch of great poems at the Poetry Friday roundup! 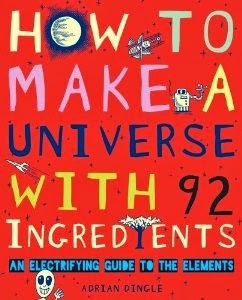 Here's a book for writers' workshop. Or storyteller's workshop. Or to add to your basket on bullying. Or just to read aloud, because kids are going to love it. Missy, who you may remember from MISS BROOKS LOVES BOOKS (AND I DON'T) is a little girl who loves to go to her school's library story each morning. Unfortunately, along the way, she has to pass the home of Billy Toomey, the neighborhood bully, who steals her hat and teases and just generally makes Missy's life miserable. 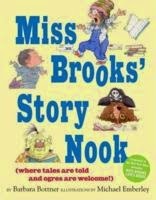 After one such morning, Missy arrives at school to discover that a power outage has forced Miss Brooks to turn story hour into story telling hour. Miss Brooks teaches the children about the elements of story- characters, setting, events, and satisfying conclusion. At first, Missy is reluctant to tell a story, but then she uses her story to solve the real life bully problem in her life! One you will definitely want to own! Apparently, we are going to have a baby year at my school. Our secretary and one of the second grade teachers are having babies in November. I've heard that another teacher is also pregnant, although I haven't seen her yet to confirm. A baby year means there will be baby showers. And baby showers for me mean baby books. Let other people buy the onesies and towels and mama slings. I'm buying books. Usually I buy several- one beautiful picture book and then a couple of board books for the baby to chew on.Often these books are lullaby-ish. "Over the ark, song flows at night. Two by two, eyes close at night. Two by two, wings furl at night. Two by two, tails curl at night." The text is accompanied by Holly Meade's watercolor collage illustrations, sure to be favorites of the toddler and preschool set. Traditionally invoking melancholy, love, longing, and metaphysical questions, ghazals are often sung by Iranian, Indian, and Pakistani musicians. And if you just want to read more poems, the Poetry Friday Roundup can be found at My Juicy Little Universe. For the last five years, Cathy Mere at Reflect and Refine and Mandy Robek at Enjoy and Embrace Learning have hosted the "Picture Book 10 for 10" where they invite people to select picture books they couldn't live without. I love this day because I always get lots of terrific ideas for new books I want to own and share with kids! And I hate this day because I always get lots of terrific ideas for books I want to own and share with kids! Seriously, this is probably one of my favorite days of the year! Head over to Cathy and Mandy's blogs for a roundup of the lists! When I taught fourth grade, my students loved David J. Smith's IF AMERICA WERE A VILLAGE and IF THE WORLD WERE A VILLAGE. Now Smith is back to address the idea of scale in ways that kids can really understand. Each two-page spread takes on a different topic- e.g. If the surface of the Earth were shrunk to fit onto two pages of this book. If all the water on the earth were represented by 100 glasses. Smith's engaging text is accompanied by Steve Adams' infographic illustrations. Absolutely perfect! Might be my nominee for CYBILS NONFICTION this year! Taro and Jimmy's parents immigrate from Japan to California, where they operate a successful vegetable stand until the boys' father is taken to prison after the Japanese attack on Pearl Harbor. Soon afterward, Taro, Jimmy, and their mother are taken to an interment camp. Jimmy, the younger brother, will not eat the unfamiliar American food, so Taro sneaks out to capture fish for his brother. 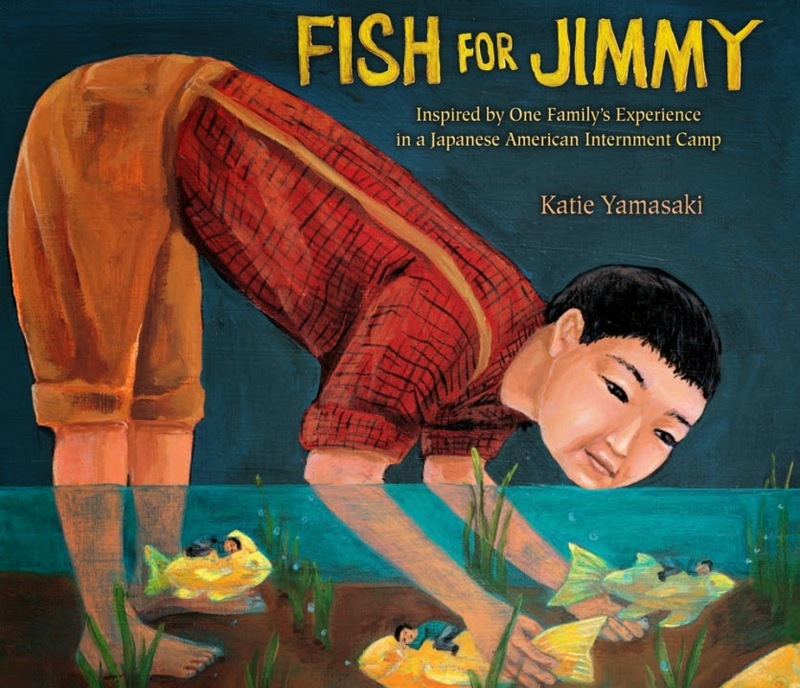 FISH FOR JIMMY is based on events from the life of Yamasaki's great grandfather, Anko Hirashiki, who is pictured in the back of the book. Taro is her grandfather's cousin, who actually snuck out of an internment camp to find fish for his son. Katie Yamasaki is a well-known muralist and applies her gorgeous art on a smaller scale to the illustrations in this book. I'll pair this with one of my all time favorites, BASEBALL SAVED US. This book was reviewed in the NY Times last year. 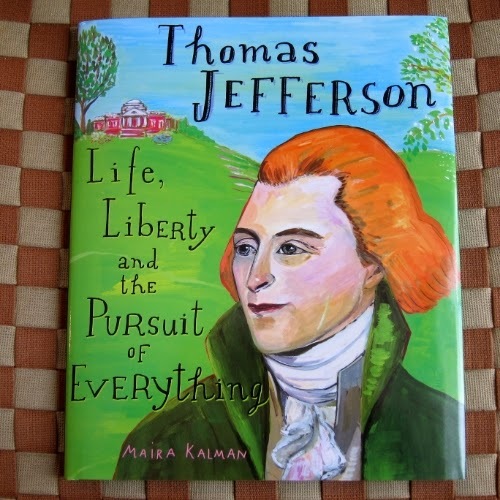 This new picture book biography captures many different facets of Jefferson's life as a lover of books, inventor, gardener, musician, and oh yes, author of the Declaration of Independence and president of the United States. It also addresses Jefferson's dark side as a slave owner and his relationship with Sally Hemings. The layout of this book and the interesting fonts are going to make this a favorite with middle grade readers. Great voice for a mentor text. It will work well with THOMAS JEFFERSON BUILDS A LIBRARY, which was on my list of favorite nonfiction picture books last winter. OK, so this one hundred page introduction to the Periodic Table is a little long for a picture book, but it's too good to leave off of this list. The book has an introduction, then four chapters, consisting of multiple two-page spreads. "Space, Earth, and Nature" includes Let's Rock, Oceans and Seas, and Make your Own Human Being. "Daily Life" has sections on money, matches, and milk and cookies. "Materials" includes Fun with Fireworks, Skyscrapers, and Dazzling with Diamond. "Cool Machines" features computers, television, and nuclear fusion and fission. I'm sharing this one with middle and high school science teachers! 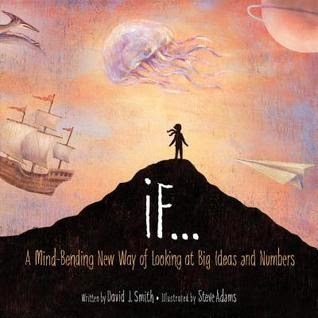 Tons of great read aloud material! And of course I can't create a list of favorite picture books without my all time favorite nonfiction picture book author, Steve Jenkins. EYE TO EYE: HOW ANIMALS SEE THE WORLD is chockful of interesting information about animal eyes. The tuatura, for example, has a third eye on top of it's head. The halibut is born with eyes on both sides of head, but one eye gradually migrates until both eyes on same side (ew!). The tarsier has the largest eye relative to the size of its body of any mammal, with each eyeball larger than its brain. Back matter includes the evolution of the eye and animal facts. 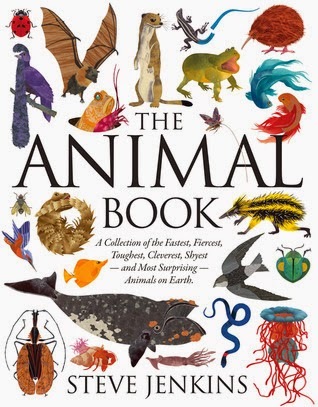 You might also want to check out another newish Steve Jenkins' book, THE ANIMAL BOOK. It's also terrific! There's no way I could create a list of picture books without at least one dog book. About two years ago, I reviewed Luis Carlos Montalvan's adult memoir, UNTIL TUESDAY. Montalvan is a veteran who suffered from severe PTSD until a service dog named Tuesday came into his life. 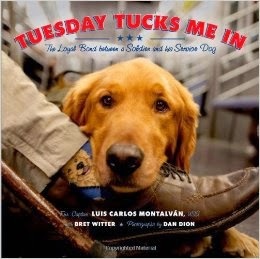 I loved that book, but I love the picture book, with full color photographs of Tuesday, even more! I have to confess, I almost didn't pick this up. The cover and size just didn't seem all that appealing. Boy, am I glad I had a minute to spare, because this series is terrific. Brad Meltzer is best known for his adult mysteries and thrillers. Several years ago, he was looking for heroines for his daughter, and couldn't find much beyond Disney princesses and decided he needed to write a few biographies for children. 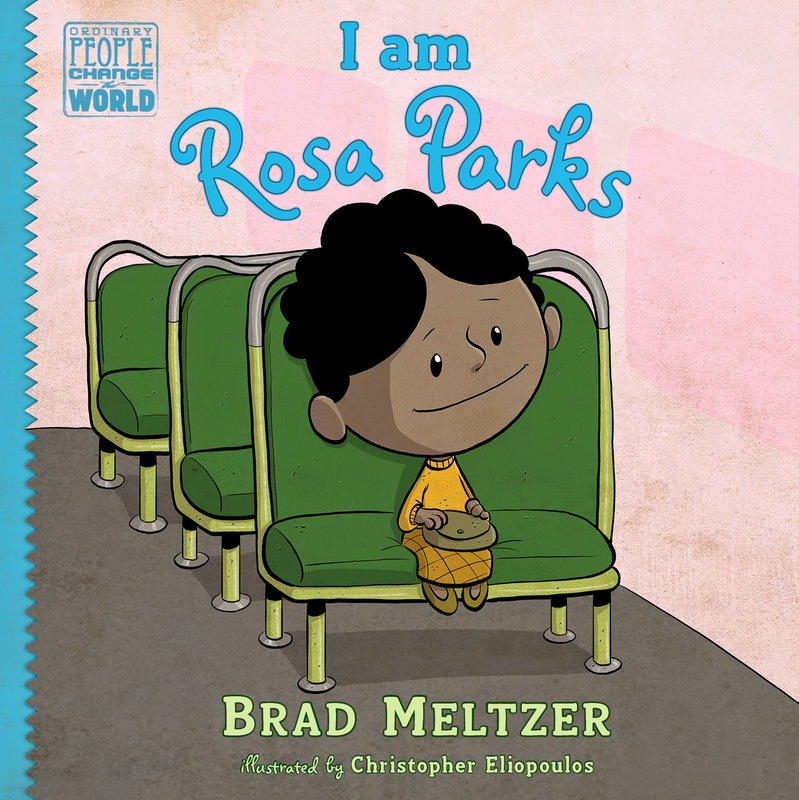 I AM ROSA PARKS follows this great American from childhood. It's written in the first person and the voice is terrific, a great model for biography writers all the way into middle school. Others in this series: I AM ABRAHAM LINCOLN, and I AM AMELIA EARHART. I AM ALBERT EINSTEIN is coming this fall and others will follow. For an interview with Brad about these biographies, read here. 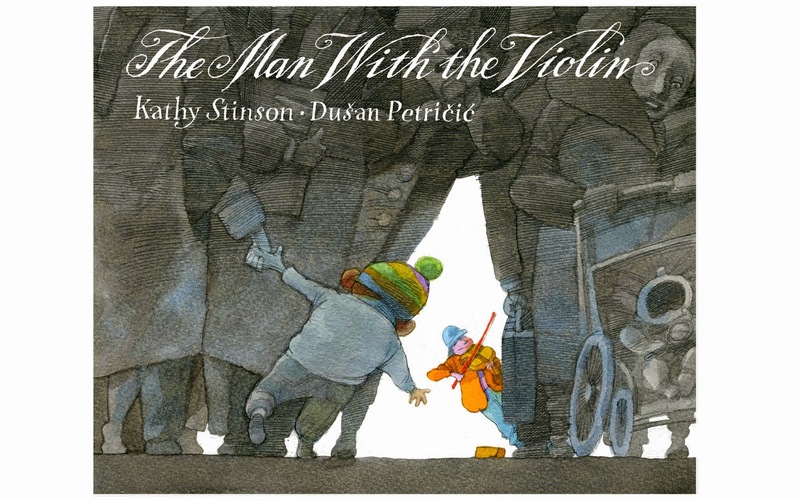 This fictional picture book is based on the true story of American violinist, Joshua Bell, who took his Stradivarius to a Washington D.C. subway station and played for several hours. People pay more than $100 a ticket to hear Bell play, but this day, at the subway station, more than one thousand people rushed by, but only a few, mostly children, stopped to listen and at the end of the day, Bell had only $32 in his violin case. End pages include photographs and an interview of Bell. I could see using this book in a writers' workshop mini-lesson on how writers pay attention to what is going on around them. Etienne Delesseret's mother died in childbirth and about three years later, his father remarried the only mother Delesseret ever knew. 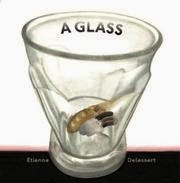 The family, like most families, had some rocky times, and the title of the book comes from an argument in which Delesseret's stepmother actually hurtled a glass across the room. Surprisingly, the glass didn't break and still sits on the author's desk today. Every child that comes from a blended family, and every stepmother, or adoptive mother, will flinch when they read the oh-too-familiar words, "You're not my mother!" Great mentor text for teaching memoir and the last line will be perfect for teaching kids about endings or about life lessons. Razia is a young Afghani girl who desperately wants to go to school. The male members of her family are strongly opposed to this until a situation arises where Razia really needs to be able to read. 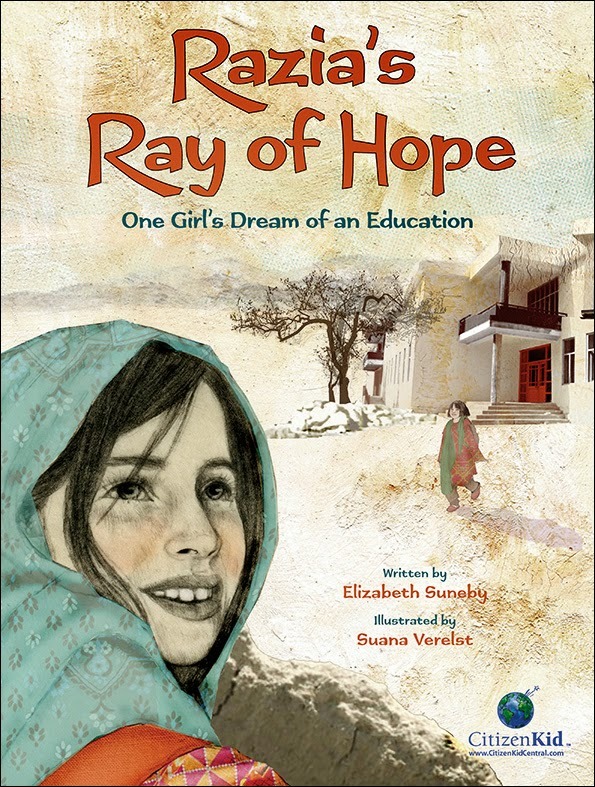 Loosely based on the work of Razia Jan, an Afghan native and humanitarian who spent much of her life in the United States, and recently moved back to her country to found the Zabuli Education Center. A terrific jumping off place for discussions about the value of education or advocacy or real world heroes! I've spent this week teaching at my district's New Educator Institute. One thousand brand new, hot off the press, baby teachers. I love working with new teachers. I love seeing them decked out in their brand new business casual teacher wear. Listening to their dreams. Inhaling all that shiny hopefulness. I am so glad they have chosen to enter this teacher life that I so, so, so love. And at the same time, I know how hard this job can be. I know about the lesson plans and team meetings and desk piles. I know about growth objectives and test prep and data dives. And cocktail party conversations and radio talk shows that make me swear and bang the dashboard. I know that many of these baby teachers will not return next year. And that almost half will be gone within five years. And I listen to all their bright, shiny, new dreams and I feel so sad. Because we need them to stay. So this morning, instead of finishing the template that was due two weeks ago, or responding to the 35 assignments that got turned in at the class I taught last night, or cleaning house in preparation for the friend that is moving in next week, I'm messing around in maudlin poetry. "A little advice to first year teachers…"
Mary Lee is hosting Poetry Friday this week. Head over there to graze on some real poetry. This has been a weird summer for me. Usually I read and read and read, devour books one after another. But this summer, I haven't read. I've consulted my TBR list. Books I really wanted to read. 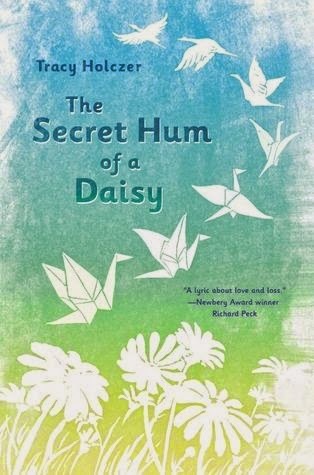 A couple of weeks ago, THE SECRET HUM OF A DAISY came in. And then it came up for renewal. I wanted to renew it. But it was the only book on the stack of 11 or 12, that wasn't renewable. So this weekend, I sat down, determined to finish it. When the book opens the main character, Grace, a twelve-year-old girl, has just lost her mother, the only family she has ever known, in a drowning accident. She wants to stay with her best friend and her mother, but instead, she's been sent to live with her grandmother, who she's never met. Through the stories of her grandmother and through people in the small town, Grace puts together the pieces of her mother's story, and her grandmother's, and her own. This is a story of real people doing the best they can, of brokenness and healing, of grief and redemption. It's a book of big life truths. Here are a few of my favorites. How sometimes it took crazy to get to normal. A book I definitely want to own for the Grace's I meet this year. 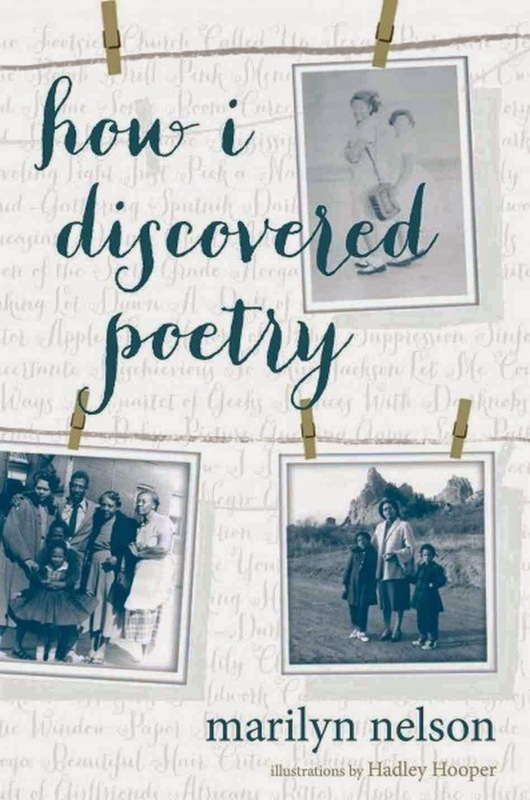 Several weeks ago, I happened across a review of Marilyn Nelson's new memoir, HOW I DISCOVERED POETRY. Nelson, an English professor and poet laureate from Connecticut, is also the author of several young adult novels, including CARVER: A LIFE IN POEMS, A WREATH FOR EMMITT TILL, and one of my favorite dog stories, SNOOK ALONE. She's also written more than twenty volumes of adult poetry. You can read some of her poetry on her website. Marilyn Nelson's father was a Tuskegee Airman and her mother was a teacher. HOW I DISCOVERED POETRY follows the family's travels across the country, from Maine to California, from Texas to Oklahoma to Colorado, through Marilyn's childhood, during the 1950's. It's a perfect middle and high schoolbook for a study on the Civil Rights era, African American history. You could also use it in a memoir study. Or you could just read and reread and enjoy it, like I did last Saturday afternoon. If you want to know more about Marilyn Nelson, here is her website.